Each time I try to use these features the messages below appear. I purchased and activated a license. How is this corrected? 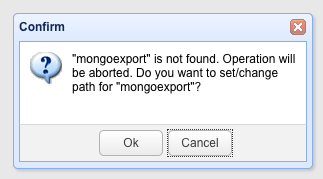 These two features depend on the external "mongoexport" and "mongoimport" executables, you need to download and install local MongoDB, and set the correct path. They can be found in the 'bin' directory of your local MongoDB installation. I see. Thanks for the explanation and quick response.